The stunning conclusion to Rae Carson’s New York Times–bestselling Gold Seer trilogy Leah Westfall’s journey has been one of ever-present peril, hidden magic, harsh realities, loss, life, determination, and love. She has searched for a place to belong and a place to call home, and people who can accept a girl with magical powers that prove to be both blessing and curse. Rae Carson has been lauded as one of YA’s best writers of fantasy, and fans of Leigh Bardugo, Sarah J. Maas, and Westworld will be riveted by the conclusion of this remarkable historical fantasy trilogy. Leah is poised to have everything she ever dreamed of on the long, dangerous journey to California’s gold fields—wealth, love, the truest friends, and a home. Thanks to her magical ability to sense precious gold, Leah, her fiancé Jefferson, and her friends have claimed rich land in California Territory. But their fortune makes them a target, and when a dangerous billionaire sets out to destroy them, Leah and her friends must fight back with all of their power and talents. Leah’s magic is continuing to strengthen and grow, but someone is on to her—someone who might have a bit of magic herself. The stakes are higher than ever as Lee and her friends hatch a daring scheme that could alter California’s history forever. With a distinctive heroine and a unique interpretation of American history, Into the Bright Unknown strikes a rich vein of romance, magic, and adventure. Leah Westfall’s journey has been one of ever-present peril, hidden magic, harsh realities, loss, life, determination, and love. She has searched for a place to belong and a place to call home, and people who can accept a girl with magical powers that prove to be both blessing and curse. Rae Carson has been lauded as one of YA’s best writers of fantasy, and fans of Leigh Bardugo, Sarah J. Maas, and Westworld will be riveted by the conclusion of this remarkable historical fantasy trilogy. Leah is poised to have everything she ever dreamed of on the long, dangerous journey to California’s gold fields—wealth, love, the truest friends, and a home. Thanks to her magical ability to sense precious gold, Leah, her fiancé Jefferson, and her friends have claimed rich land in California Territory. But their fortune makes them a target, and when a dangerous billionaire sets out to destroy them, Leah and her friends must fight back with all of their power and talents. Leah’s magic is continuing to strengthen and grow, but someone is on to her—someone who might have a bit of magic herself. The stakes are higher than ever as Lee and her friends hatch a daring scheme that could alter California’s history forever. 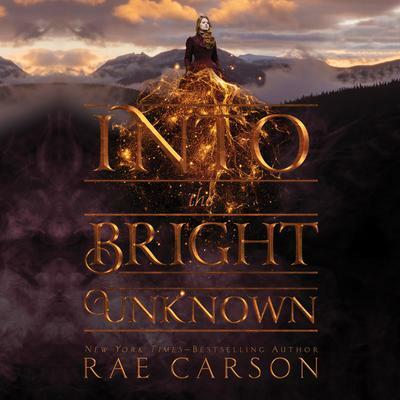 With a distinctive heroine and a unique interpretation of American history, Into the Bright Unknown strikes a rich vein of romance, magic, and adventure.